More details surfaced over Motorola Xoom tablet. 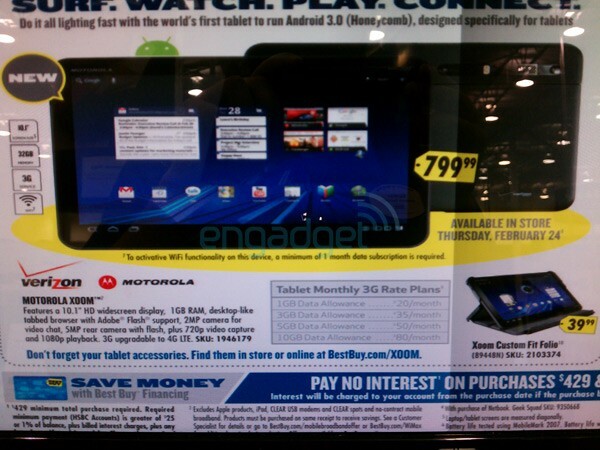 Best Buy will be having the Xoom on sale and the rumor is that it will be out this February 24. A Best Buy leaked ad also showed that the price was set to be $800. Engadget posted the ad from Best Buy which chowed that Xoom will be available in store from February 24. Thats a little expensive considering that it does not include the data plan. The fine print of the ad reads that to activate Wi-Fi functionality on this device, a minimum of one month data subscription is required. So bottom line is, you will buy a device that you will not own completely. Xoom is said to work on WiFi, Verizon’s 3G network, and its 4G/LTE network. The data plan itself will let you get 1GB of data for $20 a month and upto 10GB for $80. Xoom is set for utter failure. To force a customer to buy data plan to enable Wi-Fi is simply extortion. Motorola needs to wiseup before its too late!